I began drawing when I was about ten years old. I continued off and on through the years and picked it back up again in college because of my enrollment in a painting class with then Assistant Professor John Barnes. I thoroughly enjoyed the class! After graduation, life was life, and I stopped painting. Through life experience I have come to know that when something is inside it will manifest, and thus I started again in June 2010! Please let me know how I may be of service. 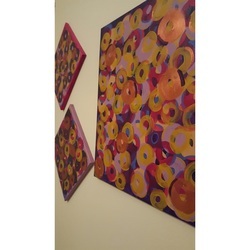 Custom creations priced according to size of canvas, artwork, and date of request. Non-refundable deposit due upon order submission. For custom creations, please use the "Contact" link under "Engagements" and include the following information: Size of Canvas, Preferred, Colors, Accent Colors, Reinforced Canvas (1”, 2”) or Print, Occasion, and Desired Completion Date.